We are huge fans of Bumbo Baby Seats – in fact, Lisa, a baby product queen when her babes were infants, was the first person I ever knew to own a Bumbo! They’ve gone from “radically-new-and-cool” to a staple for many new parents. 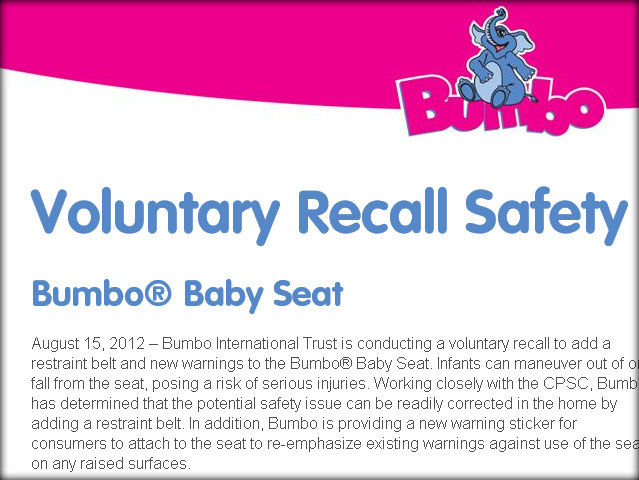 1) If you own a Bumbo and were hoping to sell it, go online and order your free repair kit. Please, bring it back and consign it at the next sale! Bumbo’s are usually one of the first items to completely disappear from our “shelves”. 2) If you have already ordered your repair kit, say a little prayer that it arrives by the sale! We ordered a few ourselves, so if you don’t have one, there is a small chance that we will. Likely, though, you’ll have to wait to sell that Bumbo. 3) If you want to buy a Bumbo, you are likely to not find them at Half-Pint this sale (unless those repair kits start magically arriving in the next week!) – or at other resale stores throughout the area until the repair kits start making their way to homes. Come back in spring! I’m positive we’ll be loaded up with them then.